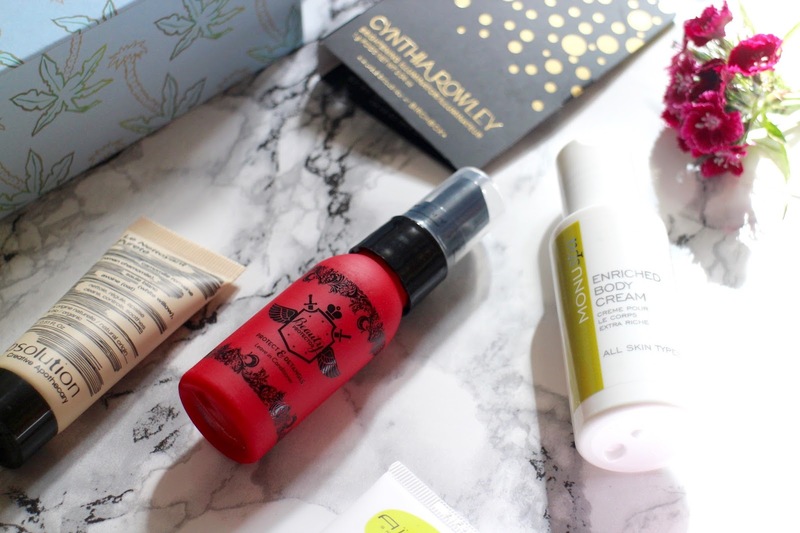 This months Birchbox UK is definitely a step up from Mays box of disappointment. 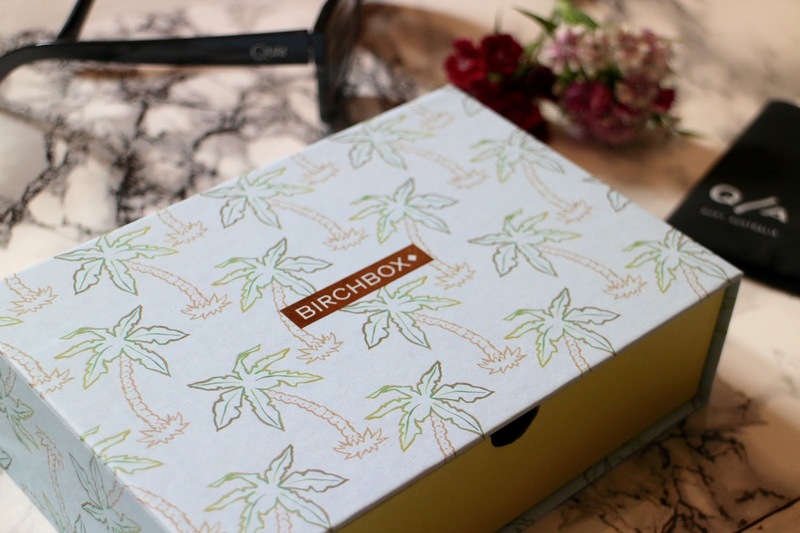 The palm tree design, and the discounted Quay sunglasses gave me massive Summer vibes and I was really happy with the products in my box this month. I also really liked how they went for a drawer on this months box, rather than the usual Birchbox sack. It's a pity that this seems to be a one time thing, because although the bags are handy for storage, I don't use them all and it's such an unnecessary waste. The drawer just seems that little bit more environmentally friendly. Maybe that's just me?? This months box came in two designs, palm trees or pineapples, and subscribers had the choice between two different style Quay sunglasses to add to their box this month at a discounted price. 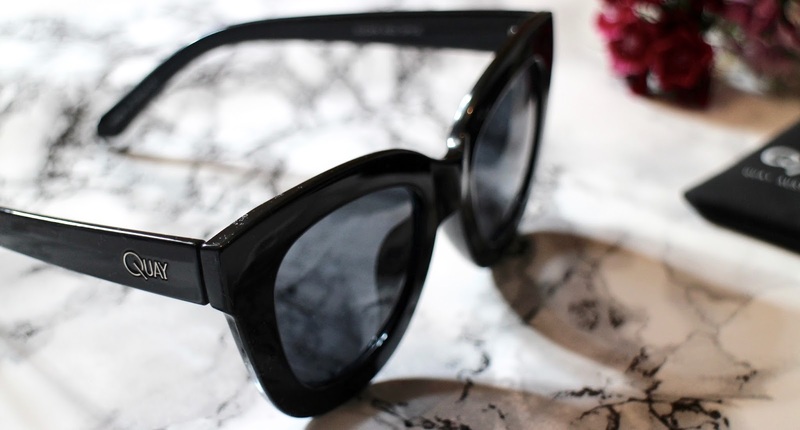 I went for the sleek black pair, as they're a little more timeless than my other pair of Quay sunglasses which have a crazy crazy animal print. I was delighted to get these at a lower price as I really fancied a black pair but didn't want to pay mucho €€€ for them. 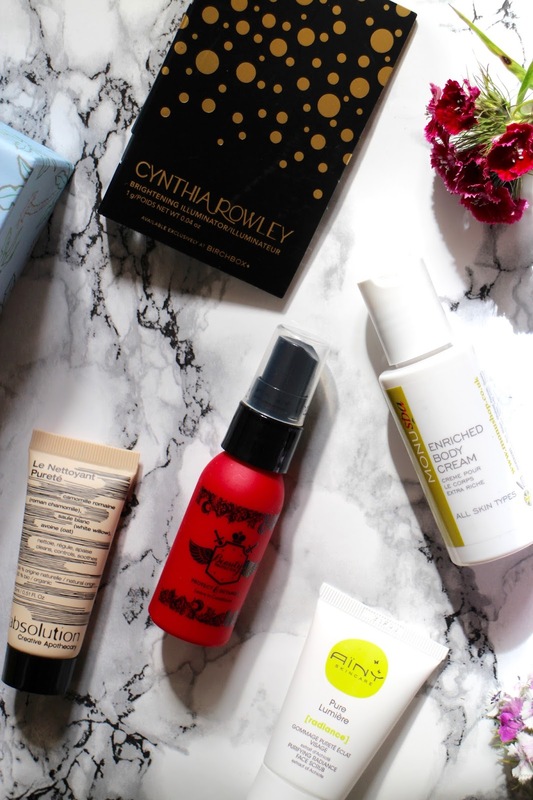 The two products I was most looking forward to trying were the Cynthia Rowley brightening illuminator and the Beauty Protector leave in conditioner. I don't have a highlighter like the Cynthia Rowley one in my collection right, it's quite sheer and pink. Where as my other highlighters are all silver/bronzey. This actually reminds me of Benefits 'High Beam' a little. I can definitely see myself purchasing this when I run out. This is the second Cynthia Rowley product I've received through Birchbox and I'm actually really loving their products. The leave in conditioner is lovely to use. 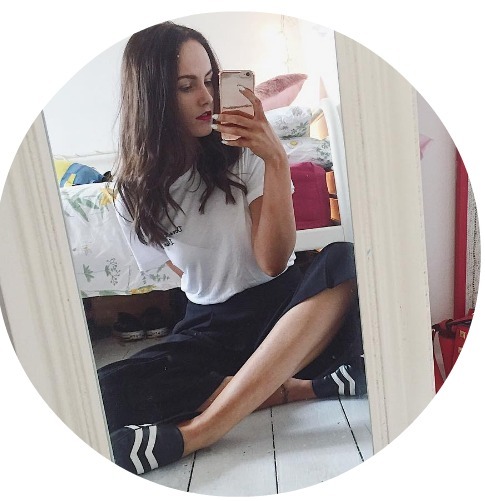 It's light on the hair, it doesn't have a sticky residue like some leave in conditioners, and it brushes through the hair effortlessly - obviously down to the detangling effect. I currently use a kids detangling spray on my hair, and although it's great and does the job, this one appeals to me that bit more because it seems like a 'grown up' detangler haha. My least favourite product in the box was the Absolution cleanser. It smells absolutely disgusting. I'm a sucker for sweet, girly, fresh scents. But this was really earthy?!? It's hard to describe but it was very overpowering, I could smell it before I even opened the box. I thought something had spilled it was that strong. I could never imagine putting it on my face. It was just not for me. I'm sure it might be a fabulous cleanser, but I was just so put off by the scent that I couldn't give it a fair trial. I haven't used the other products yet, but what I have used I really liked. Next months box is a collaboration with the absolute babe, Millie Mackintosh, and I have been so excited for this box since I saw it mentioned on Instagram a few months ago. I used to love Millie on Made in Chelsea, so I can't wait to see whats included in the box. She's designed a full size LOC lip pencil exclusively for the July box so that's definitely worth subscribing for if you haven't already.